The University of New Brunswick invites you to a literary reading by acclaimed poet Billy-Ray Belcourt at 7:30 pm on Tuesday, February 12, 2019 in Carleton Hall, Room 139, on the Fredericton Campus. Billy-Ray Belcourt is a poet, Rhodes Scholar, and author from the Driftpile Cree Nation. Belcourt’s work upsets form and genre while addressing a variety of topics and themes, including decolonial love, grief, intimacy and queer sexuality, and the role of Indigenous women in social resistance movements. 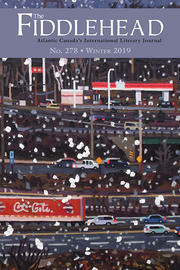 Launching Winter Issue this Weekend as Part of FROSTival! The odd sundays reading series returns with a special Frostival celebration at 2pm on February 3, 2019. This will mark the first afternoon at a new venue, the Tipsy Muse Café at 86 Regent St. Odd sundays will be celebrating all things Winter by hearing local writers read selections of wintry poems and stories, and launching The Fiddlehead's Winter issue. Reading their work about Winter will be Phil Hall, Gwen Martin and Jennifer Houle. Read more about Launching Winter Issue this Weekend as Part of FROSTival! The Fiddlehead would like to remind its readers and supporters that there is still time to donate to Galloway Suit Defense Fund: https://ca.gofundme.com/galloway-suit-defense-fund. Our Creative Nonfiction editor, Alicia Elliott, is one of the women being sued. We stand behind her integrity as an editor and support her right to a legal defense.